Thirteen students and Shihan Alex competed this year in Albuquerque New Mexico. This awesome event was held at the Hotel Cascada. This year proved challenging for everyone with some very skilled competitors in all divisions. Most of the students that attended this year were beginning thru low intermediate rank. As a total Tally for the team this year they returned with 23 First place Trophies 15 second place and 10 third place wins. Also this year 3 students attended the awards banquet with Shihan Alex to accept their awards for their point standings for the competition year. 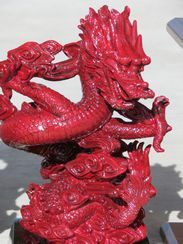 All three of the students came home with beautiful red dragon statue awards. The youngest came home with First place in the point Standings for both Kata and Kumite while the other two students captured seconds and thirds. The Shinpu-Ren Dojo was awarded as well as Hanshi Gary, Shihan Lori and Shihan Alex. What a great time this was, with many new friends made and a terrific learning experience for everyone. 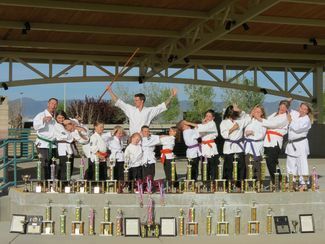 Shinpu-Ren Karate students bring home six international titles. Shinpu-Ren Family Karate had 4 students and one instructor attend the USAMA Grand International Karate Championships in New Mexico. This tournament was held in honor of Master James H. Hawkes. The team returned home with 5 International Titles, 7 seconds and 4 Third place wins, and 2 fourth places. This Tournament is an open event that attracts talent from all over the world. The newest event to be held in this arena was Take down Sparring. The participants compete in a larger age and rank bracket in this event, which makes it quite a challenge for them. Also attending this event were many famous Martial Arts practitioners’ that all of the students were honored to meet and even have their pictures taken with. The first of which was Fumio Demura, a Japanese Master of Karate and Kobudo (weaponry), his Martial Arts skills featured in the Karate Kid series films, and 9th Dan in Shito Ryu Karate. Next they met Hanshi Robert Bowles, Founder of the International Shuri Ryu Association, and last but hardly least was Mr. Bill Superfoot Wallace 23 time undefeated, PKA full contact, World Champion. This event was a thrill to attend and compete in, students came away much richer from the experience and are very excited to return and defend their Titles next year.